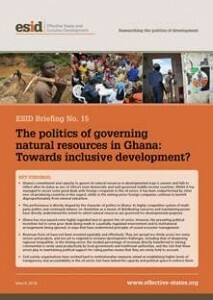 Effective States » The politics of governing natural resources in Ghana: Towards inclusive development? The politics of governing natural resources in Ghana: Towards inclusive development? In Ghana, the manner in which political power is contested tends to increase the incentives of ruling elites to politicise public institutions and distribute resources according to political criteria. This briefing sets out the ways in which power and politics in Ghana, in the form of ‘competitive clientelism’, have shaped the developmental character of natural resource governance in the country, with a particular focus on mining and oil.